-We’re back! Here’s some thoughts on April’s films. While I was dealing with the end of my law school semester and then finals, I was still able to see some of April’s movies, I just didn’t get a chance to write my thoughts down. Here they are in a very brief format. 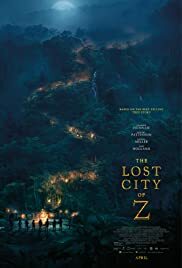 The first film I want to talk about is The Lost City of Z, a very traditional style adventure film that puts our characters through the ultimate man vs. nature test in the center of dangerous Amazonia. It’s both a story of obsession and a story of time-framing, with much of the plot struggles occurring around our main character’s search for glory at the expense of his family, who have begun to grow away from him. For those that don’t know, Col. Percy Fawcett (Charlie Hunnam) moved from being a military man to an explorer when forced by his superiors to settle a border dispute in South America. It starts as a routine job, but he later hears about a Lost City that would challenge the entire historical narrative of European society. He sets out on multiple year-long investigations to prove that an advanced civilization existed deep in the Amazon without Christian Europe even knowing. These journeys are accompanied by Fawcett’s right-hand-man Henry Costin (Robert Pattinson). While Fawcett seeks glory a hemisphere away from his family, his wife (Sienna Miller) is raising their family alone, culminating in a teen son (Tom Holland) who barely knows his father. While Charlie Hunnam’s career has been inconsistent at best, his work here demonstrates the passion of the human spirit. He clearly did a lot of work to prepare for this role, and carries the movie through his unbridled passion for discovery: both of the City and of self worth in a British culture that diminishes his contributions because he has “an unfortunate choice of ancestors.” In a way, this movie could represent Hunnam’s ‘arrival’ in that it will convince tougher viewers to give his acting a chance. He’s at a career-best focus point here, and that partially plays into the movie’s subplot about our main character being governed by his obsessions. We never question the truth that he loves his family, and does want to provide for them, but like a drug addict in recovery, he can never really rid his soul of the pull that the Amazon holds for him. As our other characters sweat and curse through their portions of the journey, Fawcett is undisturbed, happily inserting himself into the native culture of the tribes and having dinner conversations with them as if they were friends from work and not a group of cannibals with whom he seemingly has nothing in common. Director James Gray presents this as a traditional adventure, a story about Fawcett and the elements, and the result is a beautiful capture of the Amazon. It’s vast, it’s damp, and it feels almost like another planet, with the film taking advantage of long shots to ensure that they get their money’s worth of the scenery. It’s just a really special showcase of something we barely ever see, and it’s wonderful. The flaws, however, are apparent in some of the executions in the plot structure. The film takes place over about a 20 year period, and we fly through multiple trips to the Amazon, a world war, and family struggles in two hours, and it sometimes just struggles with its pace, glossing over important details to save time. Then, when we survive through some of the flaws in how the movie is presented, the ending is really, really unsatisfying. Even if this is close to how it is presumed to happen in real life, it’s very dull for dramatic effect, and you may walk out of the viewing with real disappointment in how your two hour journey ends. All in all, however, the acting and technical backdrop are what makes this film beautiful, so plot issues that are fairly easy to gloss over and forget about should not change the final perception too much. Ben Wheatley’s filmography is filled with these very exaggerated action pieces, and he’s developed sort-of a cult following around his work. While I’m not completely familiar with every film he’s directed, his exaggerated style draws comparisons to a director that he openly admits was an inspiration: Quentin Tarantino. The plot can be summed up pretty easily. Brie Larson and Armie Hammer work as agents, combining two criminal organizations for the purpose of accomplishing a robbery down the road. One group, led by Sharlto Copley and Jack Reynor supply the guns. One group, led by Cillian Murphy, will buy the guns and do the leg work. However, when two members of the combined effort (one from each group) have a pre-existing beef that causes a fight to break out, everyone in the room is forced to take cover in a bloody, hilarious gun fight that goes way out of proportion compared to the triggering mechanism. By taking a little from the Tarantino style, Wheatley makes a movie with funny dialogue, bolstered by great actors who are willing to work with the material. Although we get a serviceable group of performances from Murphy, Hammer, and even Academy-Award winner Brie Larson, the scene-stealer here is Sharlto Copley. He’s had a great career, but this may be my favorite work of his. He’s completely hysterical as a more upper-class entry in this group of grubby criminals. It’s as if Wheatley convinced some famous actors to play dress up (it’s 70s-esque) for a week and shoot some guns, and I’m completely fine with how disorganized and frantic the filmmaking is. It just makes it more fun. There’s going to be some criticism about the action, as most of it is filmed with a hand-held camera, but my response is that the movie shouldn’t be about the action. 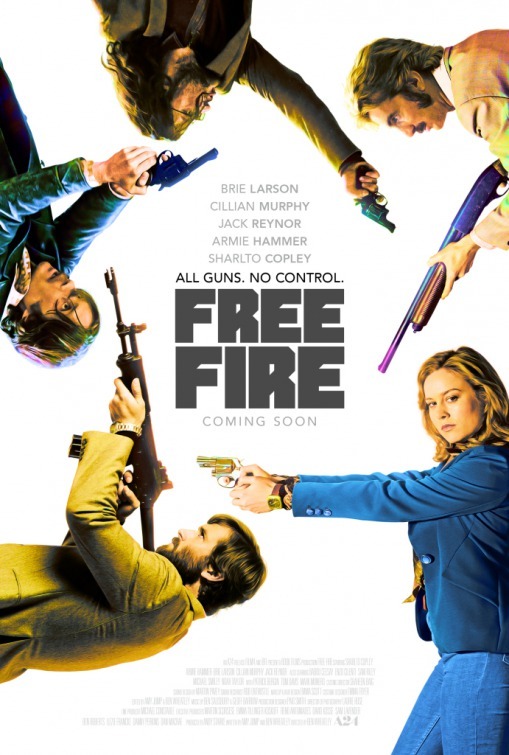 Free Fire is not about what background flaws you can pick in the structure or production value. It’s more about the actual experience of having fun through the film’s run-time. It’s very self-aware, and I had a great time. 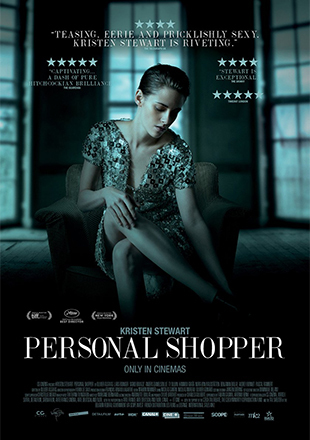 The film focuses on, you guessed it, Stewart as a personal shopper who has just recently lost her brother and has accepted two different jobs: one, working as a medium to ensure one of her friends that her new home is free of ghosts, and two, taking a movie star’s platinum credit card and doing her shopping at expensive outlets all over their city. As her days continue, she begins getting cryptic texts from an unknown number, unsure if it’s a ghost or not. The paranoia that ensues is an uncertainty between the physical and metaphysical, the material and spiritual. The phone scenes, through the texting, are directed wonderfully, and the iPhone chime has never been scarier. It’s a horror film for a patient audience, but it’s also a horror film for a modern audience, building dread using very modern mechanisms. The film is directed so wonderfully that all of the experiments and chances it takes end up as such a great reward. It’s occasionally frustrating, sure, which is why it’s not a 5-star entry, but it ends up as so rewarding that you can’t possibly dislike how powerful the movie ends up. Stewart is again great, and this is a wonderful early-year entry. As a unique darling out of Sundance starring Anne Hathaway, it may be worth it for everyone to see this movie despite some of its flaws. There’s something here for everybody, whether you’re a monster movie fan or a fan of more dramatic indie pieces. However, this is a movie with real inconsistency in tone, and can be a tough watch for parts of its run time. It’s tough to put a grade on this one because of the disparity between the quality scenes and the sub-par ones. The film focuses on a party-girl turned alcoholic Gloria (Anne Hathaway), who is ousted from her boyfriend’s (Dan Stevens) inner-city apartment after too much irresponsibility, and relocates back to her hometown in her old house. There, she reconnects with Oscar (Jason Sudeikis) an old friend who offers her a job at his local bar, and tries to get her back on her feet. But, after still continuing her pattern of getting blackout drunk and saying/doing irresponsible things, Gloria realizes a pretty crazy connection that links her to a large monster overseas destroying parts of South Korea. The positives for the film are clearly connected to how unique it is; you probably have not really seen a film much like this. It mixes the Sundance trope of being “stuck in your hometown” or “returning to your hometown that you outgrew” with something completely different, and I liked those parts. The connection is sometimes silly, and it’s sometimes powerful. The film completely relies on Anne Hathaway, who, despite people growing annoyed with her a few years ago, is a wonderful actress and delivers a pretty good performance here. It also has interesting things to say about the movie’s central theme, which surprisingly is not alcoholism, but rather Gloria being controlled and subjected to the masculine insecurities of both her boyfriend and her old friend in Jason Sudeikis. The way her character is a free spirit, and the way that the people around her try to constrain that is part of what makes the movie’s dramatic tension. The problem with that is that the motif which results from those elements doesn’t really appear until later in the film, and we get some jarring tonal shifts that make it tough to watch. It’s kind of like you left the movie for two seconds to go get a soda or something and when you return, the entire movie’s scope had changed, except that it happens instantly. Sudeikis, and to a lesser extent Stevens, go through massive character changes instantaneously, and I just can’t condone such jarring shifts in a movie because it pulls the rug out from under us. We just never know how to feel during the run-time of this movie, and although we can admire its achievements, it doesn’t deserve a great score because I just didn’t enjoy watching it. In a hope to catch this year’s “so bad its good” Lifetime thriller, I went to see Unforgettable, and the consensus of almost every critic is completely right on this one. There’s just not enough pulp to make this fun, and although Katerine Heigl gives it her all in trying to give the camera more crazy-eyed looks than Gilbert Godfrey, the violence and suspense don’t make up for it’s glamorous attempt to be horrible. These movies definitely have a formula, and they work if you can coerce laughs out of the audience, or create a “talk at the screen” movie, where audience members overreact to the silliness. That’s absent here, as my theater was completely quiet, and wasn’t the kind of ‘event movie’ that we want out of this sisterly squabble. Heigl’s husband (Geoff Stults) has left her for another woman (Rosario Dawson). Threatened by the new female presence in her ex-husband’s life, Heigl begins trying to split them up and play the ‘Fatal Attraction’ role. Caught in the middle is the couple’s daughter (Isabella Rice) who can even tell that mommy’s eyeballs are about to bulge out of her head. It’s horrible. There’s fake chatrooms, more personal information online and accessible than in a Jason Bourne movie, and a domestic violence subplot that is more offensive than it suspenseful. This could be a fun drunk rental, but nothing more. Go for The Boy Next Door instead.